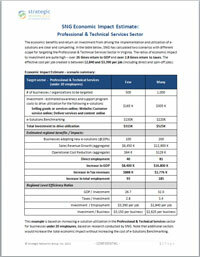 Newsletters | Strategic Networks Group, Inc. It was one of those conversations you can only have at a conference, when you are exhausted after a long day, and your edit buttons are turned off. Michael Curri and I were dining with a community broadband consultant from Georgia who wanted to know, specifically, how to sell SNG’s services, designed to drive utilization and economic advancement, into her communities. Now she wasn’t asking because she doesn’t get “it.” She understands the power of utilization and not just the power of availability. She gets what SNG does with regards to helping communities drive said utilization. What she didn’t get after a long day of sessions and networking… is how to make it simple for communities to understand. More specifically, mayors, governors, chambers of commerce, etc. So I was reminded of a book I read when looking into building “usable” websites called “Don’t Make Me Think.” What does website usability have to do with this situation? Everything. After all, when designing a website – we often design it for ourselves… it makes sense to us, so it must make sense to everyone else. It is the same with broadband. The benefits of broadband and everything that come with it are typically at our core – it is second nature. We understand the benefits that this platform for innovation provides, both economic and social. But to make it tangible, understandable, usable to most people – including most people in government – let’s answer one question. It’s a business question. What is my ROI? Even for one sector and a sizeable investment, the economic impact ratios are very compelling and well worth the investment. The actual numbers will vary, but the economic case for making such investments is clear. 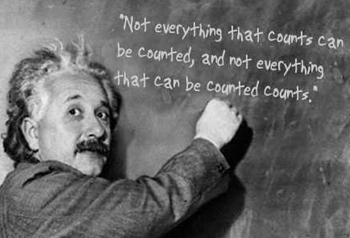 So while there is not “one number,” there is definitely a significant ROI multiplier – drop me an email and we’d be happy to run some scenarios for your community/region. Broadband Program Management… What’s the Best Way? When administering a new program to deploy broadband and stimulate adoption, governments traditionally ramp-up their internal resources or hire consultants. But there’s an alternative – a model that leverages existing local resources and links with local stakeholders who have a vested interest in the project outcome of economic development through broadband. 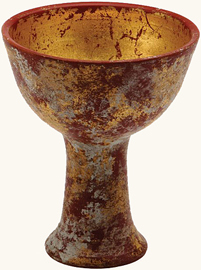 The downsides for the traditional models are apparent. Ramping-up internal staff requires hiring and getting everyone up to speed on how to administer the program. And once the program ends, the staff you worked so hard to find and train will leave. Bad enough that you lose good people you’ve invested in, but staff may be looking for a job during their time with you, looking for a better deal to move on to a permanent position. If this happens, you’re left to restart – and you lose ‘history’ before projects have been completed before they take-on their new job. For governments that use consulting support, the hiring process can be much shorter. But there is still the getting ‘up-to-speed’ time required – and it can be extensive when junior consultants are being used. Although the cost of hiring such ongoing consulting support can be high, there are opportunities to negotiate a better rate with the consulting firm as they are acquiring broadband program administration skills and experience that can be redeployed in other jurisdictions. This type of model enables the government focus on strategic and key administrative issues, while leveraging an existing network of resources that is aligned with the sustainability of the broadband projects they would administer. And when the government programming sunsets, those local economic development agencies remain as a support system to broadband projects as needed. After spending a few days in both Dallas and Washington DC over the past month, it is apparent that the biggest challenge facing broadband projects in every U.S. region is sustainability, and key to that of course is utilization. As projects are finishing building their broadband infrastructure, now more than ever is the time for SNG to help meet the challenges of going from build to use. Unfortunately, we have heard from way too many regions who tell us their adoption rates are low and the networks are not – and will not be – sustainable without major uptake. Low adoption rates (i.e. 20%) cannot sustain the ongoing operations of a broadband network where the business case requires 40-50% uptake. As your needs increase to drive uptake, please make sure you reach out to SNG as we have introduced some So they’re now beginning to focus on how to increase adoption rates and they’re realizing that they need to drive utilization with end-users – our focus and strength as we’ve again demonstrated with the new DEi Calculator. With builds nearing completion, many American States are in the throes of step 4 of the broadband lifecycle, left to wonder… what do we do now? How do we drive adoption? And at SNG we’d add…how do we turn adoption into utilization? So along the lifecycle, many regions in the U.S. have gotten the “supply side” of broadband down (building the network). 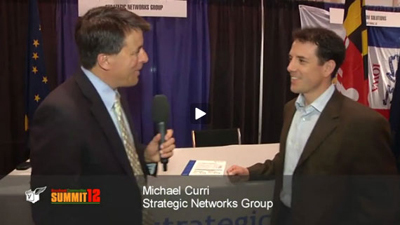 In an interview on the conference floor, Michael Curri explains the importance of the "demand side" of broadband... and how SNG can help. 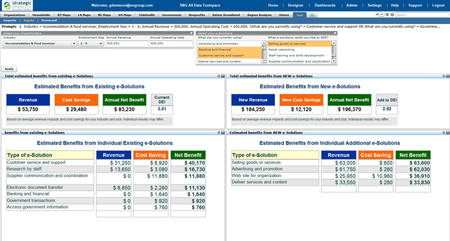 We were thrilled to receive rave reviews with the introduction of our DEi Calculator in Dallas. 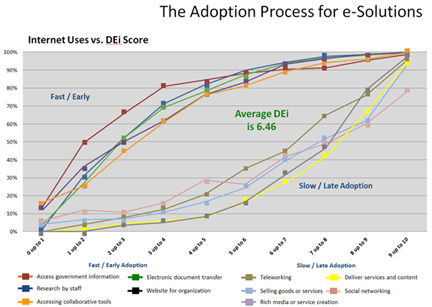 Businesses, organizations, and individuals can use the DEi calculator as a companion to the Digital Economy index (DEi) Scorecard, both designed to help them understand how to embrace new technologies and business practices, and leverage e-solutions to grow and enhance their opportunties. SNG’s Digital Economy index (DEi) Scorecard and online DEi Impact Calculator gives end-users the power and insights of years of SNG’s broadband research. Users can quickly identify ways to be more effective, productive, and competitive by leveraging broadband by comparing themselves against tens of thousands of their peers in SNG’s database. 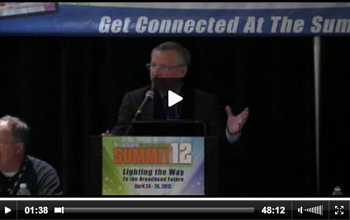 Once again, Jim Baller and broadbandus.tv did great work broadcasting many sessions from the Broadband Summit. If you haven’t already, we would encourage you to visit the site… it does require a one-time registration. Michael Curri moderated a jam-pack ed session examining the challenges of transitioning from build mode to utilization. Winning Strategies for the Emerging Knowledge Economy included panelists Bruce Abraham (North Georgia Network), Donny Smith (Jaguar Communications), Kyle Hollifield (Bristol Virginia Utilities), and Betty Zeman (Cedar Falls Utilities). For a copy of the PowerPoint from this session, click here. 1) Remain dedicated to make sure grantees complete projects on time and on budget. 2) Finding opportunities to expand projects where build savings can be leveraged. 5) Upon completion of grants, deploy the NTIA team to drive access in America. Chairman of Atlantic Engineering Group (AEG), James Salter was extremely entertaining as he looked both backward and forward. Salter had both praise and criticism for the stimulus program. Kudos for recognizing that rural broadband is “basic infrastructure” and concern for the amount of time it has taken to get things approved and moving – a natural problem given the resources available to administer this massive task. So the question he examined was – now what… when it comes to rural broadband? Salter compares the need for further government involvement and investment, much like we saw in the 1930’s, driving electricity to homes everywhere. And he sees the capacity to fund only one network in rural America – it does not matter who does it. His argument was that it is not profitable or possible to have more than one carrier survive in a competitive environment. The pure math is that there is not a big enough pie for carriers to be fighting over customers – and whatever network provides “triple play” services (TV, broadband and phone) also needs to be robust enough to serve all of the community’s broadband needs. The other day I was speaking with a colleague who is the Director of Marketing for a Tech Firm. This is a company filled with what most would consider “early adopters” and tech enthusiasts. In other words, a group of individuals who embrace broadband and e-solutions every day, in a myriad of ways. She was struggling with a decision of when to roll out a new e-solution to her sales team. It’s an online database/prospecting tool that provides invaluable information about the company’s prospects. She knows it is a great investment… a tool that will help her sales team grow their individual account base – and drive corporate sales… but, she is hesitant. You see, my colleague is a pragmatist. While her company is a tech firm, sales people are notoriously tech laggards… and very slow to change their routine. Getting them to change or adopt new behaviors can be tough, and right now she’s fighting the uphill battle of getting them all connected – and using – a new CRM program. Whether she realizes it or not, she’s preaching the SNG story – adoption is great… utilization is what really matters. And so she has a plan to come as close as she can to ensuring success. She will roll out this new solution after CRM has been adopted. She will provide this prospecting tool in a month where sales opportunities are down and sales people are more open to creative ways to find opportunities. And she will assign a few champions on the sales team to communicate the benefits and convey success stories. While regions and communities chase expanding broadband availability and bridging the digital divide, we could learn a lot from my friend… make sure you have a strategy to drive utilization. Change can be seen as scary and daunting… line up the pieces and players in a manner that is most likely to produce utilization. SNG can help. Find out how we can provide you with that plan, a roadmap for each organization in your region, and champions to show the way to realize broadband’s transformative economic impacts. SNG is not only thrilled to be asked to participate in this year’s Broadband Communities Summit in Dallas from April 24th through April 26th, but we’re also able to offer our Bandwidth Subscribers a 2/3 off discount to the event. This offer is good only for those who have not already registered and the code can be transferred to your colleagues. Register here, click the first radio button for VIP Code Holders, then enter the code SNGVIP300 for a discounted full pass. On April 24th at 4:10, Michael Curri will be moderating a panel entitled Winning Strategies for the Emerging Knowledge Economy. And on April 26th at 10:30, Michael will be on the panel for Alternative Rural Futures: Emerging Opportunities. SNG and its partners in Illinois are employing our industry-leading broadband utilization survey to build a foundation of understanding, from which we will develop broadband infrastructure planning and programs. Good data is at the heart of all good decision-making and planning as it provides insights for all that’s required to truly leverage broadband as a transformative regional initiative. Thousands of households and organizations have already submitted their responses. Broadband Illinois is so enthusiastic about the potential engendered by the household and organizations data they’ve extended response time and expanded sponsorship of participation to several other state agencies. It’s thanks to these extensive efforts that participation rates are on the rise. More than 3,300 interested in broadband flocked to Munich earlier this month to review the latest trends and best practices in our industry. We were thrilled to be able to participate and share our insights on broadband, its meaningful use, and how to maximize its benefits. Chris Holden, the organization’s president, set a tone for the conference that aligned with SNG’s own mantra – the importance of meaningful use. Holden explained that the biggest challenge facing the FTTH (fiber) market is adoption and use… driving meaningful use. Holden explained that there seems to be an understanding gap when getting people to switch. The current hope is that video becomes the killer app that will drive more people to make the switch to fiber and therefore reap the untold benefits of faster Internet. Maybe. I may be a little less optimistic than the rest that video is a silver bullet. As a broadband evangelist, I realize the message must change to get the masses to “convert.” How does video matter to businesses operations and competitiveness? The fact is that there are lots of audiences for whom video does not currently matter. The real question is how can you make it relevant to them and personalize the context? For example, for health care providers and their patients, broadband video would become relevant with the availability of telemedicine. There are no shortcuts, no killer apps, or silver bullets. It’s still Marketing 101 – tangible benefits are the only thing that moves move the needle. Some people have the experience, or can figure out what fiber can mean for them – but many do not. They need to be shown and have the value of FTTH (fiber) be personalized to the needs of their business, organization, or household – it’s not self-evident to most people how, for example, to transform their operations and deliver their services or content online. And of course, many e-solutions are more complex and sophisticated in nature, making them slower to be adopted (or understood … or both). This issue needs to be understood and addressed by providers of FTTH. 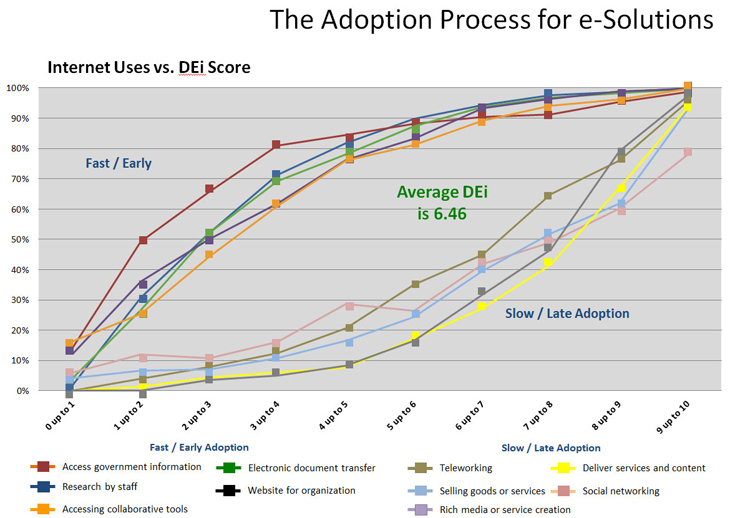 The table below shows rankings based on adoption rates for organizations with average utilization levels equal to a Digital Economy index (DEi) score of 6. As a reminder, DEi is a proprietary SNG measure where scores range from 1 to 10 (10 being highest). The higher scores reflecting the greater the number, scope and sophistication of the Internet activities deployed in an organization. Those with lower utilization adopt the easier to use applications first while more sophisticated and difficult applications tend to be adopted later, especially by organizations that already have high utilization. Until the FTTH vendors figure out how to personalize the value of FTTH to end-users, adoption and meaningful use will continue to be an issue – and they won’t be seeing the uptake by end-users that can justify their investment in FTTH networks. This is where the business case and the economic case for investing in FTTH needs to be looked at from an economic perspective. SNG presented on impacts from broadband and FTTH from SNG findings and I then turned to how that information could be used to drive economic development through broadband. I encourage you to review the material covered at the conference by clicking here. In Kentucky, the process of outreach is underway. Led by the Office of Broadband Outreach in Frankfort, KY, SNG and their partners have deployed broadband utilization surveys statewide directly to over 120,000 residential and organizations email addresses. As in Illinois the survey is open to the public and available on the host agency websites. Where in some instances, survey participation is seen in “pockets” of activity, surveys have been received from every corner and county in Kentucky. This is particularly important in the more mountainous Appalachian areas of South and Eastern Kentucky where, historically, broadband capacity and availability has been lacking. Kentucky sees a high rate of interest from radio and print media which has provided a nice little push encouraging survey completion. Greetings and Happy New Year from each and every one of us at SNG in our offices across the globe, from North America, to Europe, to Australia. Already we’ve hit the ground running in what’s sure to be a big year from Broadband with stimulus hitting its stride, from America to Australia. We look forward to providing you with our latest findings in the coming months. First, we wanted to provide you with what we hope to be something to get you inspired as we share about our two latest projects. Is your region taking a serious step towards driving a 21st century economy, or are you just building networks? If the answer is the former, you’d fit in nicely with our two latest clients. And we’d love to lend our expertise. SPRINGFIELD, Illinois, January 4, 2012 – The Partnership for a Connected Illinois , also known through its Broadband Illinois website, today announced further efforts to utilize broadband for driving better learning tools for school children, growing the Sta te’s job base, driving innovation and increasing economic prosperity, and improving health care. PCI will work in a partnership with Strategic Networks Group (SNG) and the Illinois Institute of Rural Affairs in order to maximize the benefit of public and private-sector investments in broadband deployment and use. These investments have the potential to be a transformative investment for Illinois’ 21st century competitiveness. The PCI initiative includes a state broadband strategy, informed by statewide research to measure broadband’s utilization and identify gaps. The result will be a statewide broadband plan preparing Illinois to be a leader in job creation and economic growth, education, medical innovation and quality of life. Another output of the research will be reports to individual organizations to help them understand how they can become more competitive through broadband. In developing a statewide broadband plan, the Partnership for a Connected Illinois is conducting statewide research on behalf of the State of Illinois in order to develop strategies that will position Illinois to be a leader in job creation and economic growth, education, medical innovation and quality of life. Illinois turned to SNG due to their proven track record with maximizing broadband investment in more than 10 states, and in other regions throughout the world. The solutions that SNG brings to bear will help Illinois ensure that its broadband investment has deep, meaningful, and lasting impacts. Partnering with SNG in support of this initiative is the Illinois Institute for Rural Affairs of Western Illinois University, which will help provide a statewide approach to accelerate the understanding and meaningful use of broadband for global competitiveness, job creation, and socio-economic impacts. 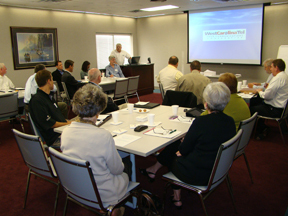 PCI, also known for its Broadband Illinois website, is a non-profit entity working on behalf of the State of Illinois. PCI collects data about broadband availability and works with local providers and communities to make high-speed broadband available throughout the state. PCI is also working to improve the adoption and enhance the impact of broadband in Illinois. Learn more about PCI at broadbandillinois.org. 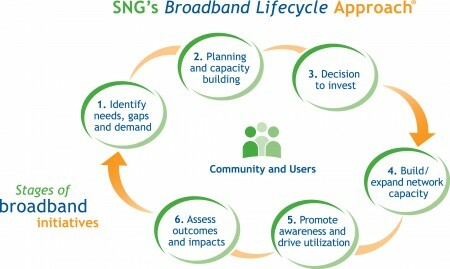 SNG is a group of broadband economists who develop strategies for most effectively leveraging broadband investments. SNG looks to help make the most broad-reaching and transformational impacts that broadband can bring enable businesses, communities and regions by delivering the data and analysis decision makers need to maximize broadband’s potential. SNG’s goals: economic development, social advancement, increased productivity and competiveness. Learn more about SNG online at www.sngroup.com and discover how broadband market analytics can accelerate regional economic development. IIRA is a unit of Western Illinois University and has served the people of rural Illinois since 1989. Its mission is “to improve the quality of life for rural residents by partnering with public and private agencies on local development and enhancement efforts.” The IIRA’s 40-member staff delivers on its mission through its research and outreach efforts. Click to see this announcement on PCI’s website. 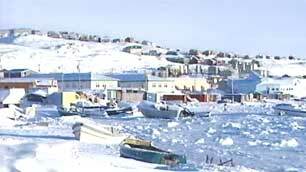 The Nunavut Broadband Development Corporation (NBDC) in Canada’s Arctic recently engaged SNG to measure the impacts-to-date of broadband investments and to forecast broadband needs and investment levels required to meet those needs. NBDC is a not-for-profit, federally registered corporation with a membership representing community, private sector and citizen interests. This project is made possible with funding support from CanNor. We’re excited to help this area of Canada harness the power of broadband. Stay tuned in 2012 for our findings and how broadband can impact even the most sparsely populated regions. Attending the Fibre to the Home Conference in Munich February 15th and 16th? If so, make sure to stop by to say “Hi” to Michael Curri and take in his presentation at 14:30 on the 15th, Socio-economic Benefits of FTTH Networks. An SNG study of nearly 600 businesses revealed a direct correlation between revenue growth and the adoption and use of e-solutions. Higher levels of utilization generate higher revenues and greater benefits for businesses. The most significant impacts on a firm’s bottom line are more sophisticated e-solutions such as teleworking, selling goods or services online, etc. – which means that firms that are not ‘fully online’ are missing out on significant potential revenue. In some cases they could grow by up to 30%. By measuring over 17 activities classified as “e-solutions,” or Internet enabled applications, SNG has developed a Digital Economy index (DEi) which measures the utilization of broadband as a platform for innovation. DEi scores range from 1 to 10 (10 being highest), with higher scores reflecting the greater the number, scope and sophistication of the Internet activities deployed in an organization. Businesses with a high DEi, meaning higher levels of adopting and using e-solutions, experience larger percentage increases of revenues (between 27 and 31%). The lower your income, the lower your utilization. The older you are, the lower your utilzation. The Internet Innovation Alliance (IIA) released its 10 ways broadband contributes to job creation and serves as a connector of job seekers, employers and employees. Sources for the research include the American Library Association, the Federal Communications Commission, and SNG. Click here for the top 10 list. Our two contributions show the multiplier effect broadband investment has, as well as how many NEW jobs in North Carolina were created as a direct a result of broadband. One out of four unemployed individuals are using the Internet to start a home business. While another 25% are relying on the Internet for education and training to help them get their next job. Even the retired are using the Internet for both of these purposes. The popularity of Netflix illustrates how market and technology shifts are posing headaches for carriers. Canada has recently tried to address bandwidth pricing but expect more developments. In 2007, Netflix started streaming its movie and television catalogue to subscribers in the USA and now has over 23 million customers in place. The same unlimited movie download offering was expanded to Canada in 2010 at a cost of $7.99 a month. By August 2011, the service had signed up 10% of Canada’s broadband households; where signing up the same percentage (albeit more homes) took six years in the United States. The success of the Netflix offerings is starting to create headaches for carriers and ISPs as they do not get revenue contribution from over-the-top applications like Netflix and yet have to invest to carry the extra traffic. The headaches remain after the Canadian Radio-television and Telecommunications Commission’s (CRTC’s) recent decisions. Digitization of broadband networks (both fixed and mobile) is causing tectonic shifts in business models. Traditionally, carriage and content went together: not any more. Entertainment was the ‘killer app’ that spurred the building of cable networks. The builders assumed they would be the providers of the content. But the impetus for delivering content over broadband is now coming from non-traditional sources that do not build the networks they rely on. Not only have the builders of networks been deprived of the revenues that they expected out of video, but also have to augment their networks to keep-up with the growth in video traffic; for which they earn very little. 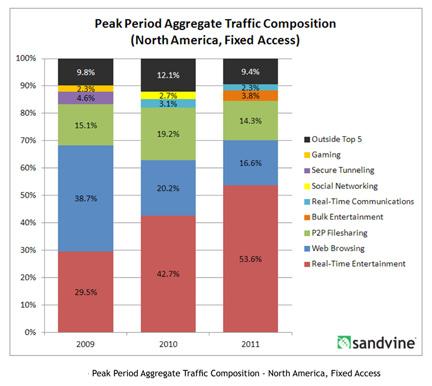 Over half the current downstream traffic on fixed networks in North America is accounted for by real time entertainment. “Intelligent broadband network solutions” provider Sandvine reports that Netflix accounted for 32.7 percent of all North American peak fixed access downstream content in the Fall of 2011. That puts Netflix way beyond the other three top Internet protocols or services by daily volume—approaching double HTTP (17.48 percent), almost three times YouTube (11.32), and nearly four times BitTorrent. Some carriers’ knee-jerk reaction to the first manifestation of this kind of traffic was to block file-sharing networks like BitTorrent. This was discriminatory and not compatible with net neutrality. The obvious neutral solution is to charge per GB irrespective of the content or its source. Volume based charging goes against the grain for those accustomed to unlimited downloads on broadband. And it is bad news for Netflix at about 2GB per hour (double with high definition) and average usage around 40GB per month. Twenty Organization for Economic Cooperation and Development (OECD) countries have no data caps at all among their broadband offers. But things are changing. Most Netflix customers are in the USA and in May 2011, AT&T slapped 150Gb and 250GB data caps on its DSL and U-Verse customers. This remedy has been over-turned in Canada. In 2000 the CRTC permitted cable carriers to introduce usage caps and/or usage-based billing (UBB) charges for their wholesale services if UBB was also applied for their retail customers. Later, this option was extended to telephone companies offering broadband access. On 25 January 2011 (Decision 2011-44), the Commission set the UBB rates at retail minus 15 percent. But the concession was not enough for many independent ISPs which together account for just 6 percent of the residential retail market. They hoped the CRTC would set a 50% discount. The January decision ignited consumer backlash and created a wave of public scorn that hit Ottawa ahead of the May federal election, quickly turning into a hot-button issue for a minority Conservative government and opposition parties alike. Also Netflix Inc. expressed serious concerns about its future in Canada – “[usage-based billing] is something we’re definitely worried about,” (Reed Hastings, chief executive of Netflix). On February 3, 2011, the federal Cabinet advised the CRTC that if it did not review the decision and come back with a new one, it would be reversed. What does this mean going forward for bandwidth pricing? The revised model that the CRTC finally produced on November 15, 2011 offers two options. First, for companies that proposed a usage-based model, their tariffs have to be based on the approved capacity model, effective February 1, 2012. For companies that proposed a flat rate model, their tariffs were approved effective immediately. The capacity model requires ISPs to choose what bandwidth of pipe it wants in order to carry traffic between aggregation points (e.g. street cabinets) and the handover point. This is similar to the wholesale model proposed for the new broadband network in Australia. If ISPs do not order enough capacity, their traffic will become congested without affecting other ISPs. This should appease Netflix and others but where is the incentive for ISPs to buy bigger pipes to accommodate traffic for which they get little or nothing? The bandwidth headache will remain until get to linear pricing on volumes. Data caps are just the first step towards that. In Europe there is a healthy competitive market for the telecommunication services, including broadband services, to end users. What is the basis for this competition? The fundamental attributes are explored briefly below. Could they be transferred to the western side of the Atlantic? There seems to be no reason why not! Economists and lawyers generally agree, to the extent that they agree upon anything, that healthy competition is a “good thing.” Competition drives down prices and encourages innovation while its opposite state, a monopoly creates an environment where innovation is limited and there is no market pressure driving down prices. In essence, an open, competitive market provides a higher degree of public good than a monopolistic, closed market focused on exploiting its market dominance to maintain high prices or restrict investment. Economists and lawyers often refer to “natural monopolies,” as those that result from a set of circumstances where only one supplier is likely to enter the marketplace. It is argued that these conditions are present in the telecommunications access market. For example, when the final section of a wired (fixed line or last mile) service closest to a house or business premises is dedicated to the individual customer, and most customers only have the opportunity to purchase service from a select provider, there is very limited opportunity for a second provider to invest profitably in a duplicate access network. This is equally true in the broadband and mobile/wireless contexts and on both side of the Atlantic ocean. Typically the incumbent, or first operator, will have created a largely universal copper network, and indeed has sometimes had an obligation to do so. In comparison, a new market entrant in its start-up phase would typically not be able to afford to re-create such a network in its entirety and will need the capability to link to the other network to provide the services they are marketing to potential customers. Typically, the service package includes the customer’s ability for their customer’s calls to connect with their competitor’s customers. However, if a new entrant’s network is unable to deliver calls made by its customers to people or organizations that procure services from another provider the new entrant will fail. In contrast, the profit maximising position for a monopoly network operator would be to refuse to deliver calls that originate from another network, or charge extortionate amounts to do so. If market entry is to be encouraged, some form of regulation is required to force provider interconnection and control its prices. In Europe, these twin concepts of the benefits of competition and the natural monopoly of the access market have long been recognized as appropriate solutions to sustainable competition and new market entry. Two recent public consultations on the regulatory regime have focussed on how to increase effective operation without any perceived need to discuss if the fundamentals require changing. The European regulation that supports this service level competition is based on European competition law. The key difference is, however, that the regulation restricts behaviours in advance, ex-ante rather than ex-post, to prevent potential exploitation by operators of monopoly or quasi monopoly positions. As noted above, exploitative monopolistic behaviours may take the form of excessive pricing or market foreclosure, and the rules operate to counter both. The prices for the wholesale services should be cost orientated, and there should be sufficient margin between the wholesale and retail prices to cover the costs of retailing. Over time the number of SMP markets has tended to fall, as competition has developed and entrants have built their own networks. A market entrant will initially invest in a core network, and as its customer base grows, it builds its network out towards the edge of the network, concentrating on the areas of highest customer density and value as this is where the opportunities are greatest . Former TV Cable operators may compete with the ex-incumbent in urban areas but SMP may remain with one, or both operators. The degree of competition in the access network remains limited outside city centres. 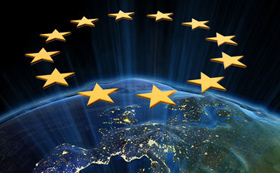 This European regulatory standards body is not without its critics, and its implementation, which varies somewhat country by country, could be improved but there is no doubt that the new regulatory standards have created an explosion of service level competition. Not only have consumers and businesses seen significant benefit, but also significant price reductions have been seen in the retail fixed and mobile markets.. Broadband services have got faster without price increases. In the European Union there are over 250 million internet users, with 95% of the population having fixed broadband access available to them, and virtually every European owns a mobile phone . The regime has not restricted investment in infrastructure, as the roll out of fibre networks into high-density areas demonstrates. A proposal from Germany to exclude fibre networks from the rules was firmly rejected by the European Court of Justice in 2009. The target for basic broadband for the 100% of the European Community by 2013 and 30mbits by 2020 is being made within this framework, and any development that uses pubic funds for network development is captured. What would North America look like if this model were adopted? There is interconnection and the FCC requires some services to be offered on a wholesale level, but the whole process is shrouded in complexity. A general obligation for local access providers to provide wholesale services and to consume them themselves in a transparent and non-discriminatory manner might be just the catalyst the market needs! How easy would a move to this model be? Well, that depends on the hearts and minds of those involved. The European model does not prevent operators being successful or prevent those who are inefficient from failing. The most successful are those that understand the logic of the competitive model and embrace it, whether as incumbent or entrant. Perhaps now is the time that this approach should be considered? The U.S. Department of Commerce recently released a report entitled “Exploring the Digital Nation – Computer and Internet Use at Home – a long report with several important findings. But our favorite happens to be results showing why the 32% of American homes without home Internet access don’t subscribe to a service. So there are more than 34 million households in the U.S. without Internet access… and while we’ve been quick to blame the digital divide, the price, that does not seem to be the main challenge. Even if we combine the numbers for Affordability (24%) and Inadequate Computer (15%), it still comes in below the number one reason: Lack of Interest. So while affordable, pervasive availability is critical – it is just as important (if not moreso as the study suggests) to show the “So What” of broadband… WHY should people adopt and then utilize broadband and its e-solutions?So while the digital divide is real and significant – perhaps as broadband evangelists, we should focus just as much effort on the the “understanding” divide. There is job creation and loss in any economy – the question is whether more jobs are being created than lost. And whether the jobs lost can be overcome with new jobs created. 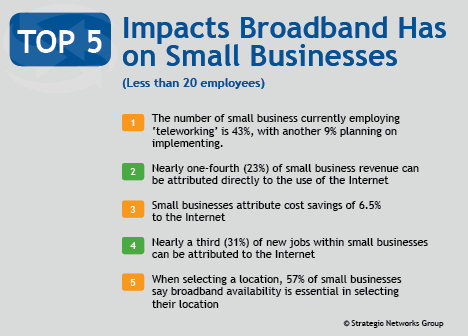 SNG research in two US States reveal that up to 30% of the new jobs being created for small businesses (1-49 employees) and large firms (over 500 employees) are directly related to the Internet. Our research also shows that small businesses create ten times (10x) more jobs related to the Internet as compared to large firms based on total employment. This is significant because if you’re looking to help create jobs in your region, it’s small businesses that are your biggest lever for local economic development. Also, given how much of new job creation is related to the Internet – broadband is becoming increasingly important for local economic development. Which means that without high quality, reliable and affordable bandwidth, it becomes increasingly challenging for firms of any size to stay competitive in an economy where more and more business activity and collaboration is online. In work across four American States, SNG research has found that not all e-solutions are created equally. Some are relatively easy to drive adoption and utilization… some are extremely different and require overcoming great challenges. When we plot out the utilization of various e-solutions versus SNG’s proprietary Digital Economy index (DEi) which measures the utilization of broadband as a platform for innovation, we see just how hard in what we’ve dubbed our “football chart” below. 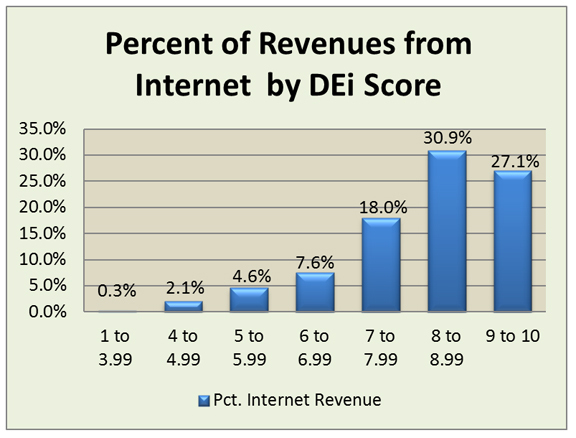 As a reminder, DEi scores range from 1 to 10 (10 being highest), with higher scores reflecting the greater the number, scope and sophistication of the Internet activities deployed in an organization. As we discussed last month – businesses with a high DEi, meaning higher levels of adopting and using e-solutions, experience larger percentage increases of revenues (between 27 and 31%). Increasing Internet utilization dramatically increases corporate revenues and job creation. So what does this have to do with the football chart? Let’s dig deeper and look at what separates the more successful organizations in utilizing broadband, creating efficiencies and growing revenues. It’s not the easy, “quick to adopt” solutions that include accessing government information online, sharing files, using collaborative tools, online research, and companies hosting their own website. These are all basic and even unsophisticated businesses are doing these. Teleworking – Using the Internet as your “virtual office,” enabling a geographically disparate workforce. eCommerce – Selling goods or services online – this can include driving leads toward payment and does not require online payment. Deliver services or content online – From customer service departments to digitized products. Are you focusing on simply providing broadband and waiting for people to adopt… and ultimately utilize e-solutions (the tried and failed build it and they will come mentality) or are you driving utilization? Focus on driving sophisticated use of broadband and you’ll see your region’s economy reap the benefits. SNG has helped to look at where gaps are and prescribe next steps for economic development through broadband in communities and regions. Earlier this month SNG’s Michael Curri and Derek Murphy travelled to South Carolina to assist in their broadband initiatives. Held by the Clemson Institute for Economic and Community Development and West Carolina Rural Telephone Cooperative (WCTel), the day long workshop gathered stakeholders interested in examining how broadband could help create a healthy and vibrant regional economy. And that’s where SNG stepped in, along with Clemson University’s Institute of Economic and Community Development, to conduct a workshop for local economic development professionals, educational communities, Chambers of Commerce, State Dept. of Commerce, and several other community leaders. SNG’s expertise in maximizing the desirable outcomes enabled by investment in advanced broadband infrastructure were seen a key to demonstrate “what’s possible” with the WCTel network. More from the SNG research front before we put a wrap on this month’s Bandwidth. It is encouraging to see 1 out of 4 of unemployed individuals using the Internet to start a home business. Another 25% are relying on the Internet for education and training to help them get their next job. Even the retired are using the Internet for both of these purposes. Obviously, when considering how to cut back on personal expenses, the Internet bill should be taken off the table. Is it time that unemployment insurance include an Internet stipend? It’s worth considering given our findings. An SNG study of nearly 600 businesses in North Carolina has revealed a direct correlation between revenue growth and the adoption and use of e-solutions. 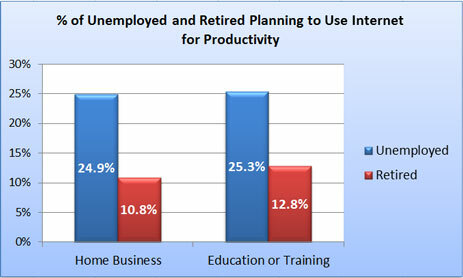 According to the research, higher levels of utilization generate higher revenues and greater benefits for businesses. The most significant impacts on a firm’s bottom line are more sophisticated e-solutions such as teleworking, selling goods or services online, etc. – which means that firms that are not ‘fully online’ are missing out on significant potential revenue. In some cases they could grow by up to 30%. The data indicate that businesses with a high DEi, meaning higher levels of adopting and using e-solutions, experience larger percentage increases of revenues (between 27 and 31%). SNG’s research thus demonstrates that increasing Internet utilization dramatically increases corporate revenues and job creation. 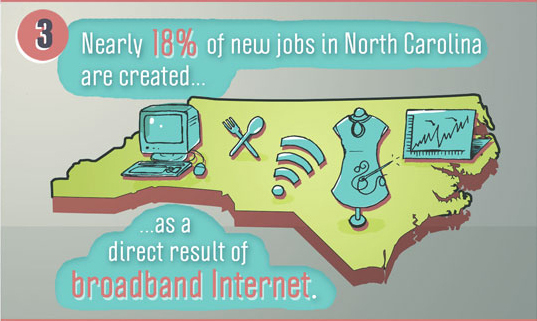 The North Carolina study reveals that the Internet contributes significantly to job growth, especially among organizations with less than 50 employees who represent over 94% of all firms and 44% of all employment. The table below shows a complex dynamic where large numbers of jobs in over 1,000 organizations were created and lost over a 12 month period in 2009/2010. As in any economy where there is job creation and job loss, the most important challenge is to drive net positive job growth. North Carolina is seeing job loss (as shown in “% Net Jobs Created”). The key is how many sustainable, knowledge sector jobs they can create through innovation. 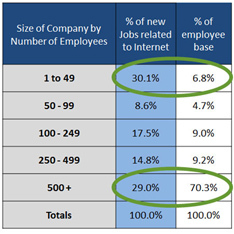 As the column “% Net Jobs Created thru Internet” indicates, small, nimble firms (less than 50 employees) are leveraging the Internet and e-solutions and creating new jobs at a rate of more than 8% of their existing base, which is a significant difference from the over 14% decline in job losses overall. This picture of both job creation and loss is a more realistic insight into the process of economic change and development within North Carolina. One key finding from this table is that jobs associated with use of the Internet grew across all organizational sizes, even while major job losses were being experienced. This is particularly significant in organizations with 1 to 49 employees. Contributed by Roland J. Cole, Ph.D., J.D. 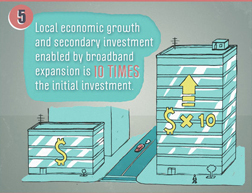 Residential broadband (distinguished from commercial broadband) is critical for bottom-up economic development. With this, there are a number of regions in the US (and in other countries) where big entities – private firms as well as government agencies, universities, and hospitals have access to broadband that is high speed and affordable, but the residences in that same community do not. In the US, while federal funds are being allocated to extend broadband to “community anchor institutions,” including hospitals, there is little or nothing being done to extend it to the residences around those institutions. I’ve seen one hospital program myself that refuses to share access with the offices of doctors that serve in the hospital, let alone the homes where they live. I’ve learned of a city that has, to great acclaim, extended its fiber to large firms, but feels that residences and small firms do not need anything better than the cable and telephone companies are currently providing. As SNG has reported (most recently in the June Issue of Bandwidth that prompted me to write this piece), a lot of purely “economic” activity takes place in homes or in sites small enough that broadband network operators treat them as homes. In North Carolina, 1/3 of those with broadband already had a home-based business, and more than 1/10 were planning to start one within the year. These activities are in addition to employees of large firms that work from home. They are also above and beyond those using the Internet to seek employment opportunities, apply online, improve their skills, etc. We’ve all heard stories of firms – countless numbers of them – that grew from basements, spare bedrooms, and garages. HP started in a garage; Dell started in a university dorm room. Some large firms that now include access to high-speed affordable broadband for their buildings as a top five or top ten item are now including access for their employees’ homes as a part of that item. Residential broadband is important even for the firms that are out of the home, because small non-residential sites get offered the same bandwidth deals that homeowners get offered, albeit usually at twice or three times the price. The network providers (both public and private) do special deals for large end-users, but NOT for small ones. Better bandwidth for these purposes is not just “speed” and price, because “speed” usually refers to download speed – largely a measure of consumption, not production. These individuals and small firms are producing, as well as consuming, and can use upload speed as well as download. Video files are huge, CAD files are enormous, high-resolution photo files are large, database files have never been dainty… and you’re hard pressed to find organizations that do not include designers, marketers, architects, and engineers who need to transport these files. Of course you could deliver thumb drives with such files… but I also could send a letter as opposed to an email. I need to remain competitive, agile, and flexible to succeed in 2011. 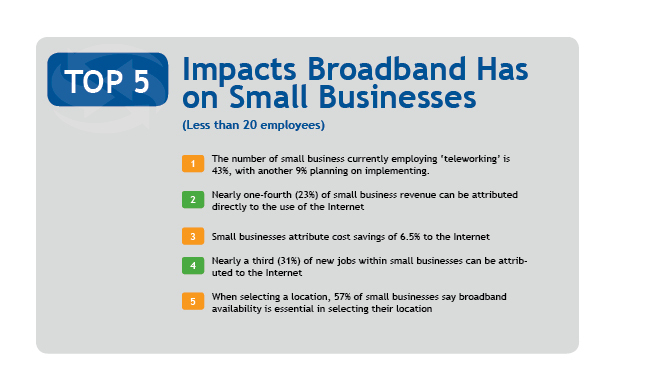 Lack of better broadband may not prevent home-based and small firm economic activity, but it sure discourages it. Better broadband provides the platform… the foundation to foster activities that grow businesses, and with them, our economies. So for one measure of how “fertile” the ground is for bottom-up economic development activity in your community, track the price and upload speed offered to your residences. Do not be satisfied when your big companies and your “community anchor institutions” have reasonable broadband while residences do not. A big aid to the firms of the future, both large and small, is better residential bandwidth now. 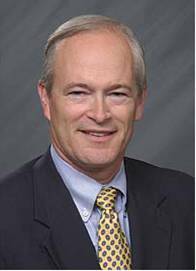 Roland J. Cole is a lawyer and policy analyst (PhD/JD Harvard) who has been studying small business and economic development for over 30 years. His work has included three textbook chapters on the role of residential broadband and the development of a toolkit for community action in support of broadband improvement. He is currently a freelance policy analyst in Austin Texas, launching a new organization entitled Fertile Ground for Startups and Small Firms. As a part of each SNG study, we take a close look not only at adoption rates and driving utilization – but also at preferred learning methods to bridge their skills gaps. It’s about individual users understanding which e-solutions will give them the biggest benefits and having the capacity to use those applications. When individuals and households need to acquire knowledge, they turn to the resources they have at hand – and of course, the learning methods they prefer. It’s about moving businesses, organizations and households up the learning curve more effectively so that they realize the benefits from broadband and e-solutions as quickly and fully as possible. Not surprisingly to our marketing department, among households “word of mouth” still scores high as a means for learning. But traditional methods are clearly taking a back seat to online learning – both informal (general surfing) and formal (webinars and online courses). 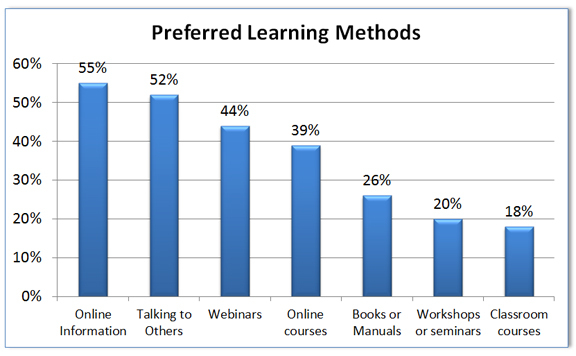 Books, workshops, and classes all come after online methods (and word of mouth) as preferred learning methods. So it is clear that we have a bit of ‘chicken and the egg’ situation here as the question becomes – how does someone maximize their learning potential, without having online resources? The digital divide obviously goes hand-in-hand with a knowledge gap. The same study revealed that 2 in 3 organizations plan to acquire at least two distinct skills sets over the next year – some through hiring, and some through training. 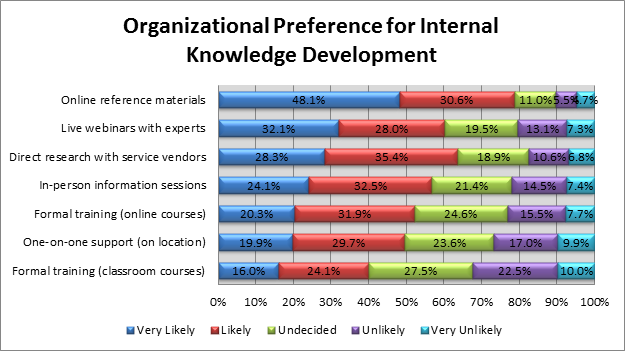 Here again we see a preference for online learning methods as self-directed methods of knowledge development, including online research and webinars, are the most likely to be used by the majority of organizations. In-person classroom training is the least likely method to be used. So, when planning for broadband, also plan for learning. Not only is it important to understand where the awareness and skills gaps are, but also understanding the preferred modes of learning. An effective strategy for economic development through broadband requires this. As a marketer, Steve Jobs has always been on my short list of ‘most admired.’ His ability to innovate and wrap his products in the flag of an Apple culture was (and is) remarkable. My wife, the traditional Apple zealot explained what his leaving meant… she said simply, that Apple will “never be the same” – that what’s missing is the ‘magic touch’ that made Jobs legendary. What Jobs was able to do was tie technology to meaning… to, as Don Draper quips in the famous Mad Men scene… take technology from a “glittering lure” and, on rare occasion, “engage the public beyond flash, if they have a sentimental bond with the product.” For those interested in the clip, view it on You Tube. Jobs drove e-Solutions with his vision, innovation, and design… but mostly by convincing consumers that to Think Different was special. He used the Apple culture (or the cult of Apple depending on your view) to engage and drive e-solution adoption. By making his products easy-to-use, he went beyond mere adoption and achieved utilization. The type of deep, involved utilization that made upgrades a must have, not just a nice to have. It was Jobs vision that the broadband would make the computer the ‘digital hub’ of the home that drove electronics and accompanying applications at a dizzying rate, transforming an industry and a world of users. Without broadband, it is at least possible that Apple does not exist today. Instead, it’s the most valuable consumer brand in the world. So now Apple now has a void. But more significantly for our purpose is the question… how do we, as broadband evangelists… do what he did? The simple answer is yes – electricity is a utility, one for which we depend mightily. But its existance does not inspire. We need to engage and inspire in 2011 when driving broadband use because it is not ingrained in our society to the depths that ‘traditional’ utilities are. What we need are solutions that transform our world, build on a platform for innovation. We need to be as vigorous in selling broadband’s benefits as Jobs would with the latest iSomething. Broadband has the ability to radically change our entire world in orders of magnitude more than it already has. But we need to get past the utilitarian view of broadband – looking at what it enables and instead what it empowers. At the advent of broadband, Apple’s campaign challenged us to push the world forward. Is what we’re doing enough to drive the complete transformative power of broadband… or do we need to Think Different? If you haven’t moved for a job, you know someone who has. More than a decade into our broadband revolution, the knowledge economy, and e-everything, it’s a bit discouraging to find that, even today, geography can still dictate individual or organizational potential for success. Still, in 2011, the digital divide limits job and opportunities, either at an organizational or an individual/entrepreneurial level, in rural areas. The Internet Innovation Alliance (IIA) ( www.internetinnovation.org/) released its 10 ways broadband contributes to job creation and serves as a connector of job seekers, employers and employees. Sources for the research include the American Library Association, the Federal Communications Commission, and SNG. Click here for the top 10 list. The digital divide has long been commonly understood to mean unequal access to the Internet and its accompanying resources and services. But as connectivity expands to more households, attention shifts to how people use and benefit from the Internet. Not surprisingly, another dimension to the digital divide emerges as not everyone is equally able to use and benefit from the Internet, even when they have and use the Internet. The same factors that impact adoption of the Internet have a pronounced impact on how effectively people are leveraging the Internet. At SNG, utilization is a key metric we examine in all regions. In the past year, SNG collected utilization data in four states from over 12,534 organizations (commercial and non-commercial) and 4,638 households giving us unique insights into this new dimension to the digital divide. Some findings are not surprising while some provide new and unique insights that cause us to take a step back and wonder how we – as an industry – should define the digital divide moving forward. Not surprisingly, SNG’s research shows that age and income have very significant impacts on how people use the Internet. 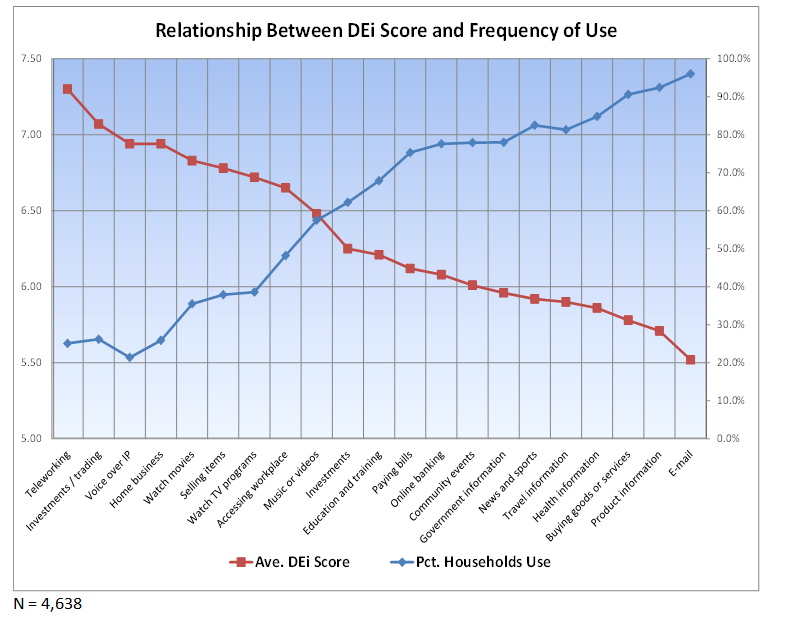 Our proprietary Digital Economy index (DEi) summarizes how households use thirty distinct Internet activities. 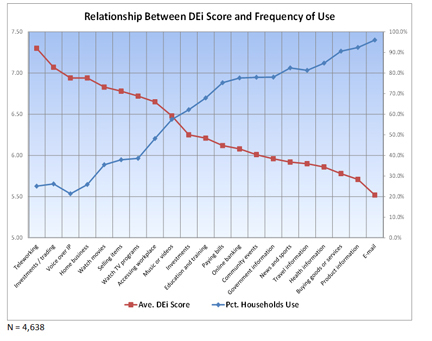 The higher the DEi, the more Internet activities a household engages. The Digital Economy index progression from 1 to 10 (10 being highest) reflects the number of e-solutions being utilized – 10 being a household at 100% utlization. Utilization is impacted by income and age – the lower a household income or the older the household, the lower its Internet utilization. The differences (or divide) is most pronounced for those over 55 and those making less than $30,000. So the digital divide is actually expanding as younger, higher income households best leverage e-solutions. So lower income individuals ages 55-plus land at the lowest level of utilization. Conversely, younger and upper income households are at a higher level of utilization, leveraging broadband more effectively and deriving the most benefits – further increasing the digital divide. Simply connecting… or even basic adoption does not complete the process of bringing people and households into the digital world. Even among those who are already using the Internet, there is a digital divide. So we need to do better, including designing Internet outreach and training programs to the groups that are still experiencing the divide. How will the older generation be able to use Telehealth if they can barely accomplish basic Internet activities? Digging deeper, for those interested in the details! 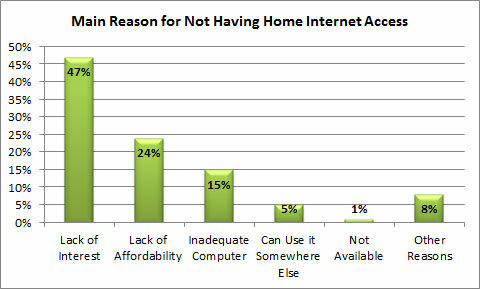 Where, specifically, are household struggling to adopt Internet activities? Our studies show that some skills and activities are easier to learn than others – the table below shows the activities where there is still a divide. E-mail, browsing and research are actively used by 80% or more of households. However, teleworking, selling online and using VOIP are significantly more challenging – but that’s where the biggest benefits from utilization are derived. The earning ability of lower and middle income households is enhanced by the very Internet activities for which they’re least skilled. Economic development investments by government or nonprofits should focus on helping drive the utilization of e-solutions that generate the most benefits for inviduals. A starting point might be more focused, targeted training for those e-solutions that have the most significant, long-lasting socio-economic impacts.